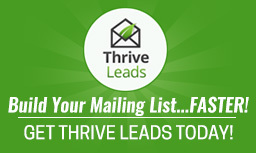 Note: Thrive Leads supports most email marketing softwares. The process for connecting them is exactly the same as in in this tutorial. Thrive Leads has an API connections feature. Simply put, this means that it is now quick and easy to connect your email software with your opt-in plugin. The advantage of an API connection is that you no longer need to copy and paste long pieces of code each time you want to create an email opt-in on your blog. I hope that this 8 step process helps you on your blogging journey. Connecting your MailChimp account to your Thrive Leads Plugin is a quick and easy process. [EP 57] Amy Porterfield Answers: What is the Best Way to Grow My Email List? In this blog post he gives you 3 scripts that you can use to literally ask people to join your newsletter list. Go ahead and try out all 3, you will be amazed by your opt-in rates. In the blog post linked below you will learn how to create a lead magnet, setup Thrive Leads and every step of the process. Learn 5 important email marketing tips that you should be doing right now to grow and nurture your list.